This week I have really been kicking it into high gear with my work outs. I feel energized after I do them, and really want to be in better shape when we head to Disney World. I know that although I may not be close to my goal weight, I will be able to walk more while at Disney and keep up my energy levels. This week I have "walked" 19.5 miles since Sunday, not including today. 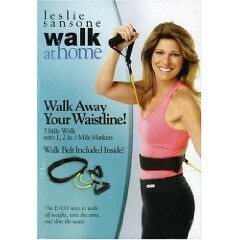 All of this has been by using one of my Leslie Sansone walk at home DVDs. Here is the week in review. Sunday (3 miles) – While the boys went outside to play I did my new 3 Mile Weight Loss Walk. It is a "power walk" DVD and uses handweights. It is a fast paced 45 minute work out that really works all your muscles, strengthens your core, and makes you sweat! Monday (5 miles) – I felt ambitious while the little guy was napping. I put in the 5 Mile Fat Burning Walk. This DVD includes five 12 minute miles that get your heart pumping, your body moving and fat blasted (73 minutes total). It went by really quickly and I felt energized. My only complaint is that I should have stopped to retie my sneaker. Apparently it was rubbing my poor foot the wrong way. I was limping thanks to a blister trying to form. Tuesday (3.5 miles) – JSL was up and did not want to nap. Mistake #1 I tried to do the 30 Day Shred first. I just can not do that in our little space and if I do try it again need to figure out what I can do to replace Jillian’s love for push ups. With my wrist injury those are just not possible. The plan was to do the DVD from Sunday and do two of the fast second mile for a total of 4 miles. I started the DVD after about eight minutes of the Shred. The little guy let me get into the start of the fast 2nd mile when he started to flip out. One thing I can not do is walk with Leslie Sansone with a 22 month old on my shins. So I stopped cold turkey and put JSL down for a nap. Once he was asleep I put in the DVD from Monday and did 2 miles with that. Wednesday (5 miles) – I wanted to target some different muscles. With JSL watching me the entire 82 minutes, I did the entire 5 Day Slim Down DVD. Mile 1 is the Classic Walk, Mile 2 Sculpts your arms, Mile 3 Slims your legs (psycho squats and lunges galore), Mile 4 Trim you tummy with lots of focus on the core, and Mile 5 speed walk. I felt very wobbly after mile 3 thanks to the intensity of the moves, but pushed on. Let me tell you, Thursday I was feeling the burn. My arms, legs and shoulders ached, but in a good sort of way. Thursday (3 miles) – The boys were kicked out of the house to play outside with JL so I could do the Walk Away Your Waistline DVD (48 minutes). I opted to use the Walk Belt and it helped to stretch my arm muscles from the aches that I had from the previous day. Today – Not sure what I am going to do yet. Since it is already late, I will probably opt for a quick 3 mile walk. I am also excited to check out the new Leslie Sansone DVDs that are being released at Target. They come with boosters that can be used. There is one in particular that I have my eye on. So what have you been up to this week in the world of exercise? does cleaning the house every day count?? :D OOh How about jumping up and down at a concert and climbing the ridiculous amount of stairs 3 or 4 times to get to our seats? I really need to make more time for me and exercise more. At least the weather is starting to get warmer and I am hoping to be able to put MJ into the stroller and walk with her quite a bit. What I’ve been up to in the world of exercise…. Funny you should ask! I just bought a prenatal workout DVD, thinking maybe if I got back into a little exercise, I might have more energy the way I used to. I’ve had the DVD a few days, and you know where it has been sitting? On top of the microwave! Wow!! A lot of working out that is great. Plus a variety. Thanks for coming by the other day. I hope you have a great weekend. Andrea McMann’s last blog post..Win one of 5 Clorox Decor Wipe Canisters!